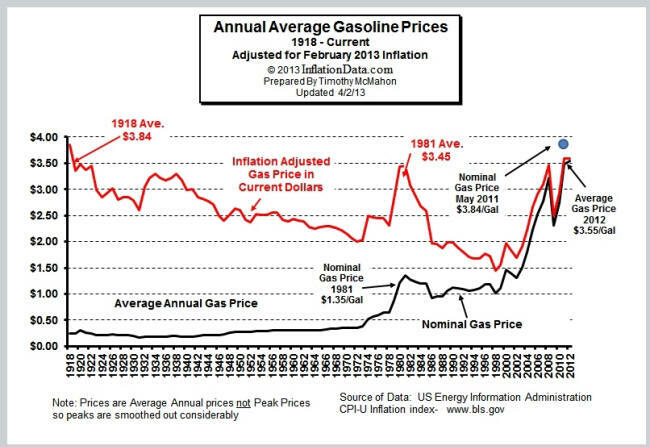 It’s almost hard to conceive that only a few years ago we were struggling to come to grips with the relentless rise in the cost of gasoline, as prices rose from the nearly constant level of a dollar and change a gallon, to over $4 in a space of just a few short years. $5 a gallon was looking inevitable, and maybe the new standard. SUVs and other large vehicles had become un-salable and were plunging in value. In the intervening years we’ve had a mortgage meltdown, a wave of bank failures, a presidential election and a killer recession — it’s no wonder the still relatively recent gas price spike is barely a shadowy memory. But as much as we may have forgotten that crisis for newer ones, it’s left its mark on our finances. Though gas prices have fallen back from their peak, they’re still at least twice as high as they were before the spike began. And if we’re completely honest, they’re not all that far off the peak any more either. $3.25 to $3.75 a gallon only looks good because we were paying $4+ a few of years earlier. So should we put fuel economy aside as we celebrate an apparent recovery? Are “high” ($4+) gas prices a thing of the past? Is the world now safe for your Escalade? 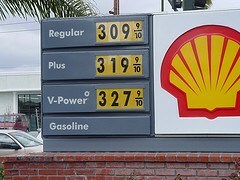 Pardon me for saying so, but rising gas prices might rain on the car buying decisions of those with short memories. When ever something isn’t in a state of crisis, it’s easy to forget how ugly it can get and how quickly it can get there. When it comes to gas prices, we should all know better by now. Major shifts in production. The easy oil land fields are the ones maturing and giving out, while new production is largely coming from hostile environments off shore (increasingly way off shore), Siberia and the Artic Ocean. Not only is oil from these sources more costly to produce, it’s often more expensive to ship as well, and that ultimately means higher gasoline prices. No matter what you read or see, don’t buy into the cheap-gas-forever myth! Since 1973 the world has experienced several severe reductions in oil production and even more periods of spectacularly rising prices, enough that no matter what the current price of a gallon of gas may be, when buying a car it’s best to assume the worst. Even if gas is only 89 cents a gallon, when buying a car you need to ask if the vehicle you’re considering would make sense if fuel prices were to rise to $4, $5 or even $10 a gallon. To dismiss this possibility is to argue against reality itself. And here’s a related issue we don’t much like to think about: should gas prices go that high, you may also be out of a job. Oil has a multiplier effect; for better or worse, the entire global economy, including and especially the U.S. economy, are intimately linked with the price and supply of oil. There’s an inverse relationship between the price of oil and the economy – when the price of oil goes up, the economy goes down – so it isn’t only higher gasoline prices we’re facing when oil rises. If you make your car buying decision based on the assumption of cheap-gas-forever—because it supports your desired outcome or for what ever other reason – you’ll be setting yourself up to face the double whammy of higher gas prices AND the inability to sell your high priced, gas guzzling vehicle into an economy that no longer desires or can afford such luxuries. Fuel economy — it matters regardless of where the price of gasoline may be. 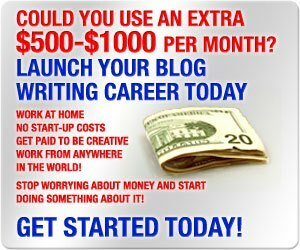 Kevin – Great post! At the right price, oil and its derivatives will never be scarce but our dollars, as defined by a barrel of oil, or portion thereof, could become so. We agree that the developing world’s appetite for fuel, as a result of their own industrialization and economic expansion, will exponentially rise. As demand rises, prices will also have to rise. What will be truly disheartening and very surprising for some Americans will be to watch prices continuing to rise while their own demand is rapidly falling due to job loss, car pooling, downsizing from automobiles to motorcycles and scooters, motorized bikes, motorized skateboards, bicyles, and walking. We see $10.00 a gallon for fuel as being very realistic given the past economic indiscretions we’ve witnessed. It could go much higher based on current and future indiscretions by those running the printing presses. Oil and the dollar will continue to have an inverse relationship for some time to come. S&D, I completely agree. Throughout my life, oil/gasoline has be a persistent problem–in on again/off again fashion–but the general progression seems clear: prices are heading higher over the long term. Even if prices are behaving, as they are now at relatively high levels, we should never take our eyes off the times when they spin out of control. Once prices start moving they tend to do so relentlesly. There won’t be time to adjust once that happens, so seriously considering it now is more important than we like to think about. The human brain is blessed with a number of circuitry “enhancements” that help us cope with all the data available to us. Unfortunately, some of those enhancements don’t help us make better financial decisions. The temptation is to look at gas prices today and assume they will continue. In fact, real gas prices today are lower than they were in the 70’s and there are many reasons (most mentioned in this blog) why they will revert to that higher norm in the future. A vehicle purchase is made on a 7-10 year time window. That’s how long the purchase is supposed to last. It is best to base that purchase on variables (including projected fuel costs) over that same time period, not just where prices are today. Well said John. A car is most definately a long term asset. If you buy a gas guzzler, because gas prices are low at the time of purchase, trading it out won’t be easy or profitable if gas prices skyrocket. Based on the history of gas prices, and on the apparent lack of domestic control over their direction, it’s best to adopt a micro strategy that puts you in a position to deal effectively with the results of a sudden spike in prices. I’m not a big fan of collective solutions, but if government is going to get involved in anything, energy alternatives strikes me as a worthy choice. I’m not surprised gas prices are going to continue to rise. The power source industries are a static bunch; bearing an absolute refusal to change. I learned this when a few of the big dogs began to patent the electric car on the people. That’s the thing about gas though. It’s that very mechanism of scarcity that drives profit, be it real or perceived. I’m baffled that consumers just don’t catch onto this sort of thing, in spite of how obvious it is. I am sure gas prices will keep rising. What seems to make gas prices unique is that they fluctuate so wildly that people have strong reactions. The fact is, I personally have no alternative but to buy gas. We have a terrible mass transit system (well, nonexistent) where I live, so I drive. A lot. Whereas this opinion may not be popular, fuel economy is not at the top of my list when I purchase a car. I have 3 kids and I am on the road constantly. I drive a crossover and I love it. No it isn’t a hybrid and it isn’t the most fuel efficient, but it is safe and comfortable. I did try to find the most fuel efficient car in the crossover category though. Whenever I read about gas prices, I think back to when I was a kid and gas prices were over a dollar. Everyone was gong crazy and driving to Canada to get cheaper gas. We even had to buy a gas cap with a lock because someone had siphoned the gas out of our car overnight. Memories! Everyday Tips – I remember those days as well, and it seems as if we revisit them every few years. It’s only when the prices spike that we come face to face with the results of poor buying decisions on cars, fuel wise that is. Back in the fall of 2008 we had an actual gasoline shortage here in Atlanta that gave us a glimpse of what life was like in a nearly gas-less world, and it wasn’t pretty. Commuting was being interfered with, shopping came to a near standstill, and civility was lost in the long lines at filling stations. People driving hybrids and 40 mpg compacts were looking pretty smart, while those driving gas guzzling SUVs were looking…trapped! Hybrids and electric cars are cool but at $20,000+ I can’t afford one. Most people can’t. Also, I refuse to drive a car that is as long as my bath tub. It was concern over gas prices that caused us to buy a car with an efficient 4-cylinder engine for my husband. We know that while gas prices fluctuate and have returned to “lower” numbers ($2.45 around here for regular unleaded right now), they could bump back up to $4 and beyond in the blink of an eye. If they go lower, that’s just a bonus. We make sure our tires are properly inflated, drive the speed limit and change our air filters on schedule in order to maximize our cars’ fuel economy. The government and crazy save the environment wackos want everyone to drive a car that is a long as my bath tub and gets 70mpg. And the car costs $30,000…. I can’t afford that. I can’t afford any new car. Gas prices don’t need to rise. They only rise for one reason. Human greed. FB–That’s why it’s so important to consider fuel efficiency when buying a car. All of the alternatives are prohibitively expensive, especially as fuel prices rise. interesting article. I wrote an action plan to increase the effectiveness of energy, and wrote about it with some examples of mobility. It consist in 5 steps to increase sustainability. For anyone who’s interested, I recommend checking out Olmo’s site. Energy efficiency/economy/conservation will only be more important as time passes. This is an excellent piece and your conclusion is spot on. Here in Malaysia gasoline is, by comparison, dirt cheap at just USD 0.85 per litre. Yet the average monthly salary is just USD 2500, and the cost of a new car is in excess of USD 30K thanks to some heavy import duties. Fuel economy and price sensitivity is such that most banks offer special petrol credit card products (cashback on petrol purchases) and every gas station has an extensive loyalty programme. Hi Yuen – Your comments show that this is a global issue, not just a US problem. I somehow think that we’re a bit better at ignoring the problem here in the US. But when gas prices spike, it’ll be panic time. In the US we think that nothing should come between us and our “right to drive” whenever, where ever and for as long as we want. Hi gasoline prices is a subject that I have written about myself on occasion. Prices in the US are high because of political decisions that have been taken by the Obama Administration. I point out the lack of approval of the Canadian pipeline as an example of willful acts designs to increase prices. Regulatory acts such as the number of different grades of gasoline in the US ( I believe its close to 64 different types of gasoline) also contribute mightily to higher prices. The willingness of states to pile on extra gasoline taxes causes even higher gas prices. As you know the US economy is slowed by these higher prices. Hence the lack of a robust recover is the result. The over involvement of the government in all economic decisions is the real problem. Hi Mike – What I find interesting (and disturbing) is that govt is involved in every facet of the economy but we have no coherent energy strategy. I also blame the Bush administration for not embracing renewable energy more vigorously in the aftermath of 9/11. That would have been a better long term strategy then simply sending out the military to invade a couple of countries – 19th Century style. A decade later, the effects of that strategy are still in doubt as we try to stairstep our way out, still uncertain what will fill the void when we’re gone. What’s also troubling is that we have this weak recovery going with gas at $3.50/gallon. It makes you wonder how bad things will get when it rises to $5. (Actually I don’t think we have to wonder how this will play out.) The point is, that when it comes to gas prices we’re on our own, and that makes buying the most fuel efficient car a priority, even when gas prices are calm. Yuen Tuck, that’s $3.21/gallon. That’s not “dirt cheap” by U.S. standards–at all! For me, “dirt cheap” is still $0.89/gallon, which I recall in NJ sometime about 12 years ago. I’d be drooling over $1.50 right now. $3.21 is “fair” for *this month*, but anything over 3 still feels painful. Notice that inflation adjusted price was going down (mostly) from 1918 to 1974, and the nominal price never dipped above fifty cents for that entire 56 years! If a man were born in 1900, got his driver’s license in 1918 (if they had them then! ), he could drive from 18 until age 74 without once seeing gas go over $0.50/gallon! In less than 10 years, I saw it go from $0.89 to, at one point about $4.50. Hi MC – I had a feeling that the liter/gallon price would be about the same. Energy/oil prices are set on a global level so the main difference from one country to another is often tax rates charged on fuel. I too saw gas go from under a dollar to over $4. It’s my opinion that we’ve become numbed by gas prices, maybe because there really is no immediate alternative. We pay the higher price and make the best of it. But there’s no doubt that the fortunes of the economy are closely tied gas prices. Technology fans want to believe that we’re moving away from dependence on physical commodities, but that’s a complete delusion. This problem will be with us for a long time, if it’s ever solved at all. Yow. Curious if you think there are such things as *sane* “save the environment types”? What do you mean by that, Kevin, and why not a fan? I agree, Kevin, with your point about Bush post 9/11, as well as Obama; both should have pushed (if the Congress would work with them, which is always a tough one now), for a kind of Manhattan Project on alternative energy. 9/11’s impetus might have been the “Sputnik” of our time, and, yep, 12 years later and it might have begun to bear some fruit. It sure seems like it is going to have to happen at some point anyway, and the sooner we make the transition the easier a lot of other resource/land management is going to go. (I make it sound easy; it might be difficult to the point of impossible; I hope not). Hi MC – What I mean about not being a fan of collective solutions is that when government takes over an industry or enterprise there’s fraud, waste and undelivered promises. Do you remember Jimmy Carter’s “Synfuels” program? 35 years later and we still have nothing to show for it. What I’d much prefer is for government to create strong tax incentives and an open regulatory environment that will favor renewables. Maybe funding research too. The Europeans have a good model that’s working, but of course they don’t have the Big Oil factor either. But the point is, it is doable without the government taking over the industry. I’ve always believed that if/when a renewable revolution were to happen in the US, it will be a grass roots event, where people will quietly and steadily shift to renewables in response to a spike in gas prices, or a longterm disruption of supply. I’m very lucky to live in Malaysia where the regular RON95 fuel price is only around US$0.65 / litre, which is heavily subsidised by local government. Hi Eugene – I’ve heard about Malaysia’s super low gasoline before. Enjoy the advantage!